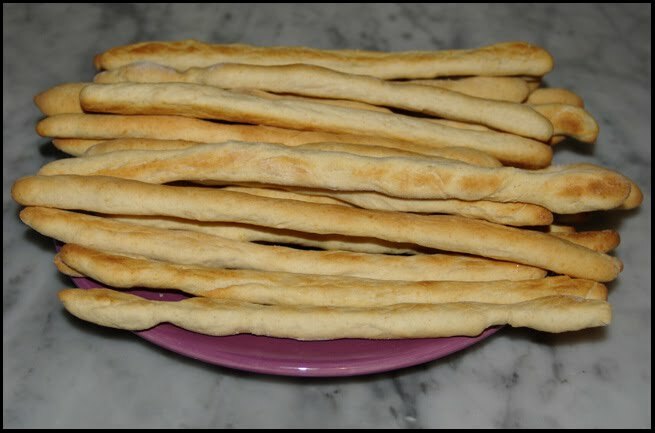 I've wanted to make breadsticks for ages, and Jill helped motivate me to do so. She's good that way, getting me motivated to bake. I chose the recipe from Dolce Italiano by Gina De Palma--she's the pastry chef at Mario Batali's Babbo Restaurant. The breadsticks were fabulous and I love the addition of Parmigiano-Reggiano and cayenne in the dough; they have a nutty flavor with just a bit of heat in the background. I used sea salt instead of cheese as a topping since I really like crunchy bits of salt on top of breads. I think I rolled the dough a bit thicker than the recipe intends, but I prefer breadsticks that are a little soft in the middle while being crispy on the outside. These were so much better than the dry as dust breadsticks you can buy at the store, or the puffy-doughy breadsticks some Italian restaurants serve. I definitely want to make these again and again. Place the warm water in a small bowl and sprinkle the dry yeast over it. Add the pinch of sugar and stir the yeast to dissolve it. Set the yeast aside to proof for 5 to 7 minutes. Place the two flours in the bowl of an electric mixer with the salt and cayenne pepper and stir to combine them. Check the yeast to make sure it has proofed; it will appear foamy. Make a well in the center of the dry ingredients and pour in the yeast and cold water. Attach the dough hook and knead for 2 minutes; the dough will start out rough and gradually become smooth. Stop the machine and add the 2 tablespoons of olive oil, 1/2 cup cheese, and butter; then continue kneading on medium speed for 2 to 3 minutes. The dough should be relatively smooth and beginning to pull away from the sides of the bowl. Remove the dough from the bowl and, on a lightly floured board, knead it by hand until it is velvety smooth and elastic, about 1 minute. Place the dough in a clean mixing bowl greased with olive oil, turning once to coat it. Cover the bowl with plastic wrap and set it in a warm, draft-free area to rise until doubled, about 2 hours. Preheat the oven to 375F and place racks in the center and lower positions. Prepare three baking sheets by brushing them lightly with olive oil, lining them with parchment paper, and them brushing the parchment with oil as well. Turn out the dough onto a lightly floured board and divide it into 4 pieces. Return 3 of the pieces to the bowl and cover with a damp towel or plastic wrap to prevent them from drying out. Cut the dough into 10 or 11 1-inch pieces. Using your hands, form the breadsticks by rolling each piece into a long strand, about 14 to 15 inches long. Keep your fingers spread apart, gently stretching the dough as you roll. Repeat with remaining 3 pieces of dough. Place the breadsticks on a prepared baking sheet, 1/2 inch apart. You should be able to fit 10 or 11 sticks on each sheet. Use a pastry brush to gently brush them with olive oil, and, sprinkle them lightly with additional salt, or, grated cheese. Bake for 12 to 14 minutes, rotating the baking sheet halfway through. The breadsticks are done when they are an even golden brown. Allow them to cool for a few moments on the baking sheet before removing them to a rack to cool completely. Please check-out Jill's delicious version of grissini on her blog. Here's the link to King Arthur's "00" flour. It makes really lovely pizza dough. They look great! I totally agree about the doughy restaurant ones - yuck. A chewy, crusty texture is much better. Mine were all crunch, but in a good way. I think we're motivating each other. I sure wouldn't have made grissini yesterday if it wasn't for you! These look fantastic! I love grissini but have never made it.